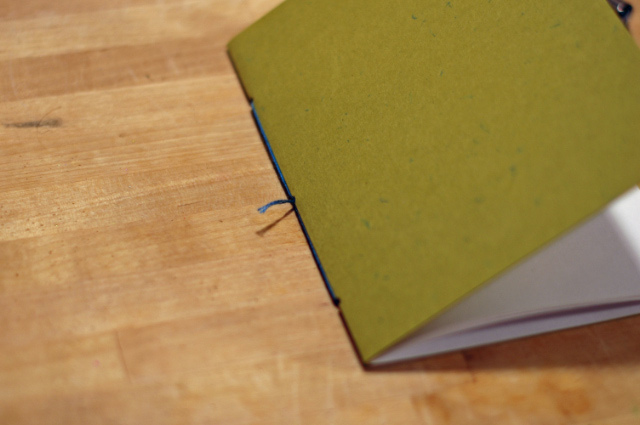 I bet that just about every craft blogger out there has a SouleMama post that sends them sprinting for the worktable, & mine was the one about the tiny books. 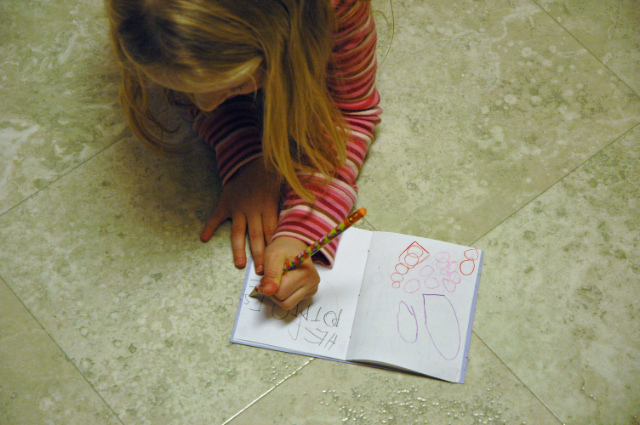 My kids are dedicated artists & storytellers (especially my daughter, who loves narrative like nobody I've ever met, except maybe me, which I suspect is sometimes very, very tiring to the men in our household), we have teetering piles of pads & notebooks & story pages & drawings all over the place, & still it had never occurred to me to have a stack of little books around waiting to be filled up instead of waiting to bind the finished product. 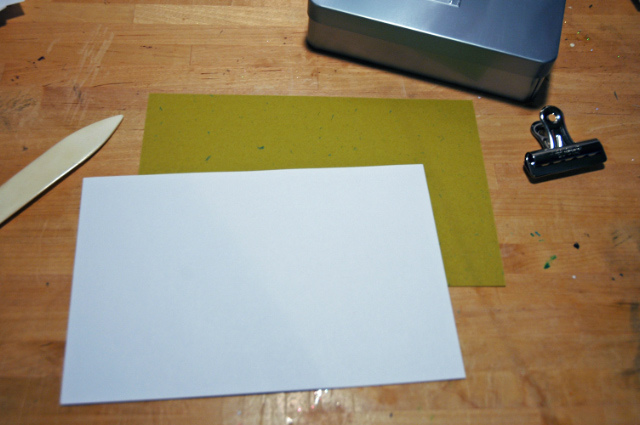 I had the cardstock & paper, but no working stapler. I did, however, have plenty of embroidery floss, a longtime love for the book arts, & an inability to pass up the opportunity to make something just a little bit more complex in the name of aesthetics. 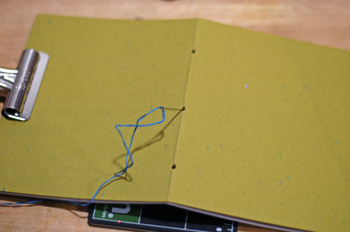 Though, really, simple stitched books like this are barely harder than stapled ones. 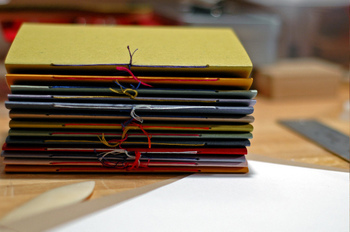 Fold the cardstock in half (to 4.25" x 5.5"), then do the same with the stack of paper. 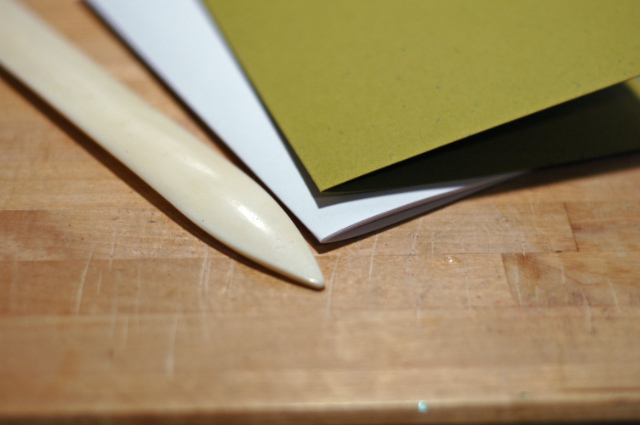 A bone folder will give a nice crisp crease. Put the cardstock on top of the stack of pages, matching at the fold line, then clip together on one end. Punch three holes along the crease. I happened to have a spring action "anywhere" punch around, so I punched 1/16" holes, but you can use anything that will make a small hole, really. & back up through the center hole. & you're done. 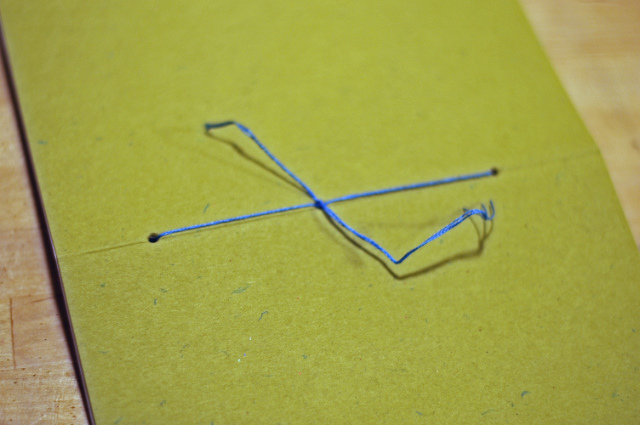 Barely more time than stapling, right? My kids spent the entire afternoon with these. ENTIRE. I am not exaggerating. EDIT: My punch is the "instant setter" from Making Memories, which I picked up at my local stamping store when I needed to set some Paper Source snaps into wedding programs without ruining the smooth tops. 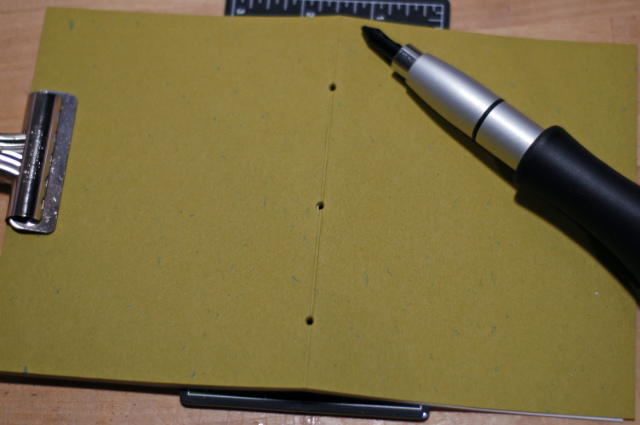 I like it fine & use the hole-punch tips pretty often, though I don't think it's that much quieter than the old-school individual hit-with-hammer "anywhere" punches I already had (I see Making Memories has a lo-tech punch-only version too). 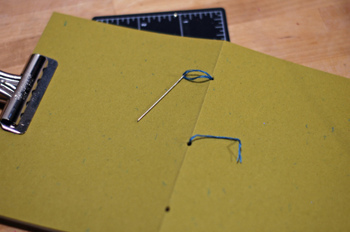 Keep in mind, though, that you don't need fancy scrapbooking tools for this project: try an awl, or a hammer & small nail. 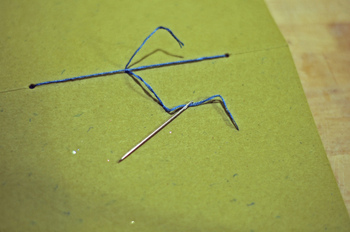 Oh, I love them with the embroidery floss! And the rainbow stack of blank books would inspire anyone. It is such a good idea--enjoyable for the kids to make and then entertaining for them to read many times in the future. 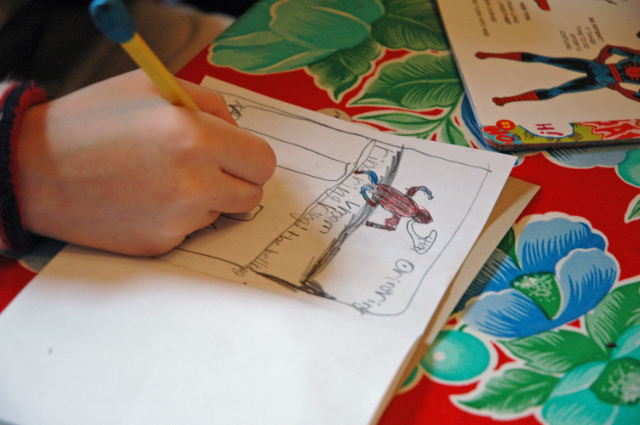 That is a great idea for little books to color in -- thanks for sharing! thanks for the little tutorial. that post of amanda's did it for me, too. 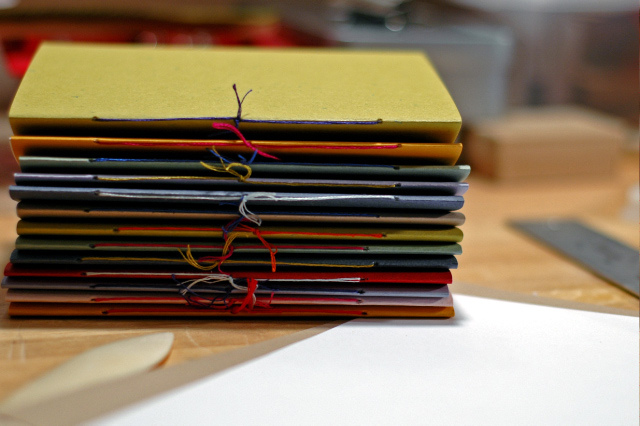 i thought that a nice stack of these and a color pencil roll would make a great bday party favor or present. you know i hate the junk. I really like the idea of the floss instead of stapling. Where did you get a punch like that? I have not seen one like that before. Thanks for how to. Great idea, I may need to whip up a few for all the little cousin's in our lives for Christmas! Thank you soooooo much for these instructions! I'm going to try my hand at this. I think maybe even I will be able to do it! Where did you find that cool punch? I just got back from Office Max, Staples and JoAnn and was unable to find one. i need to get one of those punches. I adore this idea! Thanks for the instructions! awesome! 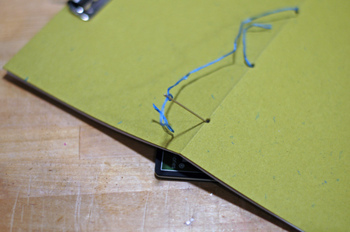 I love this method of binding - and you explained it so well! Calvin's been using elastics, which are only marginally successful. But we should try this! Thank you!! I have just made a few of these, and all I did to make the holes was use a large embroidery type needle to pierce through the card and paper, it worked a treat. Although I do like the look of that hole punch you used (but in the UK you never see cool stuff like that- well I don't!) Thank you so much for the step by step guide, as usual v v helpful! Thanks for the tutorial. I am going to *attempt* to make them for all the kids in my kids' classes for christmas. *attempt* as in trying to get 80+ done in 3 weeks. :) Thanks again. Oh, more gift ideas- perfect! I can't wait to whip some of these up. Thanks you. Yay, more gift ideas- perfect! I can't wait to whip some of these up. Thank you. Just made a few for a gift exchange and they turned out great. Found a punch you use with a hammer (could not find one like you have) and it worked really well but gave my sleeping husband a bit of a scare. Thanks again! What a wonderful idea. I love it! Love it love it can't wait to try it in every color combo! Our house too has piles of books-in-process (my 4 has a thing for staples but my 9 sews them in a different way than yours)... so much paper is in our house, in fact, I'm convinced we're a five alarm fire waiting for a match! thanks so much for the tutorial! i made a stash of books and then used a book making book to make another book, with a coptic binding, in which we chronicled our visit to a farm! So funny. After reading SouleMama's post about the writing center for her kids, I made them as Christmas presents for my neices. They were a big hit! Beautiful. I am going to make a bunch load for my sons first grade class. I will post them when I am done :). Thank you for solving my no-junk-gifts dilemma. I made enought tonight to give each chld in my daughter's preschool class three spiffy books for graduation. I used cotton perle instead of floss and tomorrow we'll make some gift tags to match the covers.